The Small Munsterlander (SM) from Germany, originally called the Kleiner Munsterlander is one of the latest versatile hunting breeds to gain popularity in North America, although they are one of the oldest hunting breeds in Germany dating back to the 13th and 14th century. The breed is thought to be over 500 years old, having originated from the Munster region of Northern Germany. The breed was not very popular until the 1800’s when changes in the legal, social, and governmental structure of Germany created hunting opportunities for common people. The commoners generally needed a versatile hunting dog that was capable of handling a variety of game birds and animals. The SMs versatile and cooperative nature provides for a reliable foundation for all types of hunting. It is well suited for a variety of game, including the tracking of big game. Small Munsterlanders are accomplished at adjusting their search pattern relative to the cover conditions at hand, performing well outside of gun range in open country and reducing their range in dense cover. Under all circumstances, they remain responsive to the handler. Small Munsterlanders excel as bird finders before and after the shot due to their exceptional noses. Many SMs point with intensity from early puppyhood, and many also honor naturally. Given their passion for retrieving, steadiness needs to be encouraged through training. Many SMs have voice on trail or scent when tracking game, which is a desirable trait especially in Europe. The hunter can hear the varied/difference intonation of the dogs voice and know what type of game it is tracking. Strong and pleasant dog with a medium size, athletic build, expressing well balanced, proportions with plenty of distinction and qualities. In upright posture, the dog has a distinguished head, smooth lines and a horizontally and well-flagged tail. The front legs are feathered, while the hind legs are with breeches. The coat of the breed is usually glossy, dense with medium length either slightly wavy or straight. The movements are graceful and far-reaching. The coat colours include large patches of brown on a ticked or solid white. Very intelligent and highly trainable, but training may be a challenge if the owner is inconsistent or meek. It requires, firm, gentle and tolerant training. The dog is an excellent hunter, tracker, retriever and pointer in fields and water equally. They are extremely fond of swimming. It thrives on hunting or challenging exercise for 60 minutes or more a day. 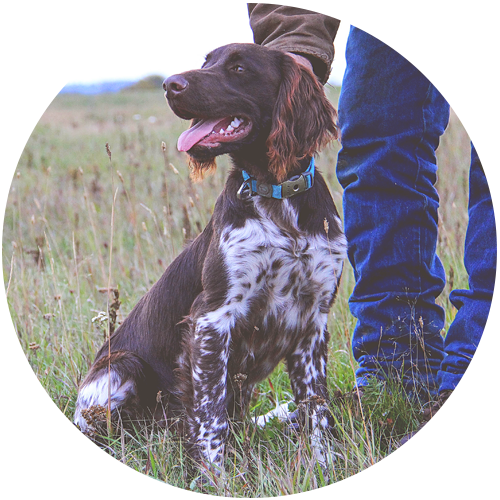 It may be a happy, patient, affectionate and loyal family dog when in the house, keen on hunting, retrieving, pointing and tracking while in the field. Due to their sociable instinct these dogs are not suited to kennel life but prefer to live in the family. They are an alert and social dog suitable for family life and keeps close contact with its master. Copyright © 2019 Four Point Kennels - Design by Olive West Design Co.